Opening your closet doors, are you starting to feel the need to have a clear out? Is your wardrobe space getting cluttered, neglected and simply messy? Well, what better time than the present to re-address the organization of your closet and to start again from scratch to tidy it up! It may seem like a massive task to undertake, and you may be worried you simply do not have enough time. Or are you are thinking about taking it on but struggling to find any inner motivation? Well fear not, because my 6 simple steps will not only help you to get the job done in half the time, you will also be able to help out your local charity shops. Hopefully reading this article will help spur you on to swing open those wardrobe doors and get organizing! It always seems that starting a task like this is the hardest part, but once you start emptying clothing out, there really is no other place for it to go than back in where it came from, so that can force you to tidy as you go! Before you get started with any closet cleaning and clearing out, try to make sure you are wearing comfy clothing such as leggings and a vest top, as you may frequently want to try on your clothes to check for fit and if you still like how they look on you, so it helps to wear something light and simple. Think comfy gym gear or that tracksuit you wear in the house all the time! 2. Completely Empty that Closet Out! Now that you are physically dressed for the task, first things first; put on your favorite music in the background to motivate you as you tidy, (this will work better than a television show because you can end up watching it, so stick to music or radio if you can). Then clear some floor space in your bedroom and go ahead and empty that whole closet out, I mean the whole thing! Take out all the spare hangers too. You may even find an odd sock or top shoved down the back somewhere that had long since fallen off a hanger and been forgotten about! Next up, clean and dust your whole closet space down, shelves and all. Now, you should have something resembling an enticing, clean and attractive closet space to fill again. Stand back and admire all your hard work cleaning. (Give it a few seconds before you turn around and see the huge mess you have created on the floor or bed behind you!) But fear not, you can conquer this mountain of clothing! Follow the next steps for some guidance on how to go about successfully re-organizing that whole closet space. So if you simply do not have the time to clear your whole closet out in one day or two, then you can still do the above steps but just take it one section at a time. For example, start with something like shoes or jewelry and see how you get on with organizing that first. This way you will continually feel like you are making progress, and your ‘closet cleansing’ will become a sort-of ongoing therapeutic project for you. This next point now applies to both the large scale closet cleaners among you and the smaller ones; categorize! It cannot be emphasized enough that closet categorization is key to actually wearing and using all the wonderful items you have in your collection. Firstly, because you are more likely to see say a blue wool jumper if it is going to be stored with the red and green ones, and secondly; your closet will look more visually appealing to you and therefore has the highest possible chance of staying neat and tidy for the foreseeable future. (Or until next week, whichever is sooner!). But it really does help to categorize your clothing, so approach that mountain of clothes and start making some preliminary piles. Tops in one, skirts in another and so on. If that does not work for you, and it might not because everyone approaches their closet organization differently, then make your categories specific to you; for example you may have a work wear pile, gym, holiday and so on. At this point, still try to keep each section vague; try not to start saying that’s an ‘evening skirt’ and that one is a ‘day wear’ one, as you will only create too many sub-piles of clothes, and things will get too intricate too fast which would be very confusing! So initially large piles are the way to go, and already you’ll feel you are making some progress here! This is the most critical step to take when clearing a closet out fully, and so often we all skip over it thinking we know better. Your body shape may have changed in the year since you bought that bikini and your mood or opinion of a certain item may have changed too from when you made a purchase. I always say that the best approach to take to be truly critical is to imagine you were in the shop right now trying the item/s on. Ask yourself; ‘would I buy this right now?’ and ‘is this flattering my figure/shape?’ and ‘do I feel confident and happy wearing this item?’ Of course, if you have a partner, husband, wife or friend who can offer you another opinion, then you may find that helpful too. However, you are the one wearing these items so it is your feelings and mood that counts most when you are wearing them after all. Take the time to tackle trying each section on one piece at a time, and literally try on each and every item. For example, in your work wear collection; see if that top really does go with that trouser suit and if not, you are now going to create three closet-wide sub-categories; ‘Yes’, ‘No' and ‘Maybe’. But do remember that each section needs to be divided up this way into three sub-categories. (At this point the ‘No’ pile can also refer to clothing for the trash that is too worn or old to pass on to others). It can get very messy in terms of floor space if you are not careful, so that is why it is advisable to take it one section at a time. (Write up or print mini paper signs if it helps, and place these in front of, or on each pile, if you are worried you may mix them up). Try not to give in to adding too many things to the ‘Maybe’ piles and be ruthless! Otherwise, you will only create more work for yourself later on. Normally, if your gut is having doubts about a specific item, then it really probably belongs in the ‘No’ heap. You should have an instant happiness or liking to the items left in your ‘Yes’ piles too. A good rule of thumb is if you have not worn the item once in the last year, then you are probably not going to wear it at all, so place items like that on your ‘No’ piles. Carry on in this way assessing each item through physically trying it on, a section at a time and eventually, (after too many clothing changes to count! ); you should have gone through your entire closet. So well done you for getting this far! Phew! If you have made it this far then well done again because it is not only time consuming to empty and re-organize a whole closet, it is also effort and requires a lot of self judgement and we don’t always enjoy self-criticism, who does! But now you are over the messiest part of the closet clear out, so you can start to confidently sub-divide your category items that we made earlier. For example, sequined skirts in the ‘evening skirts’ pile and floral lace ones in the ‘summer or day wear’ pile, you can be as creative here as you like. Order by color, sleeve length, season, material and texture too if you want to be super organized! Before you start old habits and putting things back where you thought they went before, use this opportunity wisely and stand back for a moment and visually assess the space. 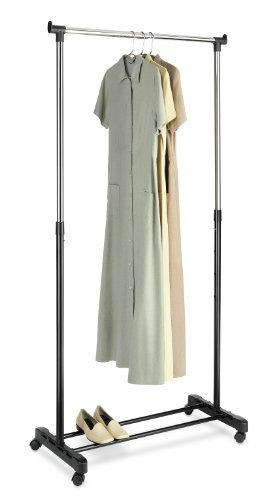 If you had skirts all on hangers which took up lots of space and two big jumpers on a shelf, you may realize you want to swap these sections around and have all your skirts on that shelf and the jumpers hanging up and so on. Clear acrylic boxes for shoes, jewelry or even makeup can not only look sleek and modern, it will also look clean and you will be able to see your products more clearly. Therefore, in theory you will be more likely to reach for something new or different from your collection each time! As I have mentioned in tip 5, group your items by season, colors and type. Use crates and boxes to organize shoes, and a tie rack could even double up to help organize your jewelry and long necklaces. 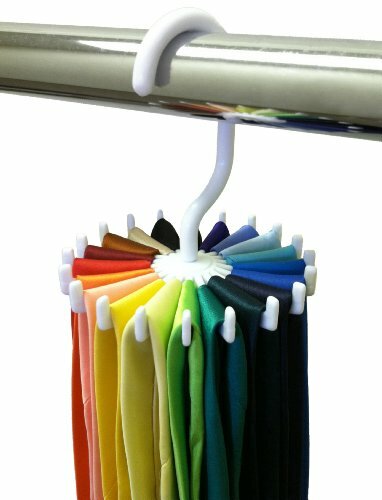 This tie rack is great because not only is it neat and compact, it could also be used for belts or other accessories such as long necklaces. As well as this it is extremely cheap yet robust with non-slip arms. You have finally made it through and come over the other side of that clothing mountain! Fun can begin again as you will probably now see this as an opportunity to update and add to your clothing collection! Now what to do with that ‘No’ pile I hear you ask; well why not organize and host a ‘clothes swap’ evening with friends? (After all you are now an expert on organization!). It can be a fun and exciting way to give your old garments a new lease of life and also to get new and exciting items for nothing for your collection! Given to charity shops your clothing donations can go a long way. Or you could put your unwanted items on eBay or a similar site to sell. Finally, step back and enjoy all your hard work and your fantastic clean and reorganized closet space! Below is You Tuber Melissa Maker on her channel 'Clean My Space' not only discussing but showing you how you can clean your closet out and re-organize it. Thanks for the tips. I am really planning to organize my closet this Christmas vacation. Hello, you're very welcome! I'm glad the tips are of some use. I did one closet in recent months, but this is perfect timing because I have another I am dreading and keep putting off. Thanks for the tips! thanks Leigh, glad it's helpful. It's always a job that's easy to put off doing, but it's always very satisfying when it's done! thanks Wizardloo, glad it's useful! the video provides a visual reference too. Thanks so much for the tips. I do have a daunting closet that I have to take care of sooner rather than later. you are very welcome Millsy36, I'm glad it's of use to you. I agree, it can be really daunting to start clearing a closet. But once you start the task, there really is only one option to complete it! I tend to rush the initial emptying part somewhat as it can encourage you to do a thorough job and to really commit to the task ahead.